Your Stupid Minds finally makes its Hammer podcast debut with a film that strays a bit from the usual Hammer formula. We don't see a traditional horror monster, and Christopher Lee is cast as the hero. A creepy, occult-obsessed Dracula-looking hero, but a hero nonetheless. It's 1968's The Devil Rides Out! When Nicholas, Duc de Richleau, (Lee) and his friend Rex Van Ryn (Leon Greene) visit their friend's son Simon (Patrick Mower, looking a lot like Topher Grace), Nicholas recognizes a five pointed, goat-faced floor installation and suspicious rooster to be signs that their young friend has fallen in with Satanists, even as Rex flirts with Tanith (Nike Arrighi), a young ingenue. When Nicholas and Rex disrupt a Satanist gathering led by the evil Mocata (Charles Gray), rescuing Simon and kidnapping Tanith, it escalates the conflict into a full-on Satanist vs. good Christian battle of wills. More people are involved, seances are conducted, and crucifixes are thrown at puppets. It's all great fun! 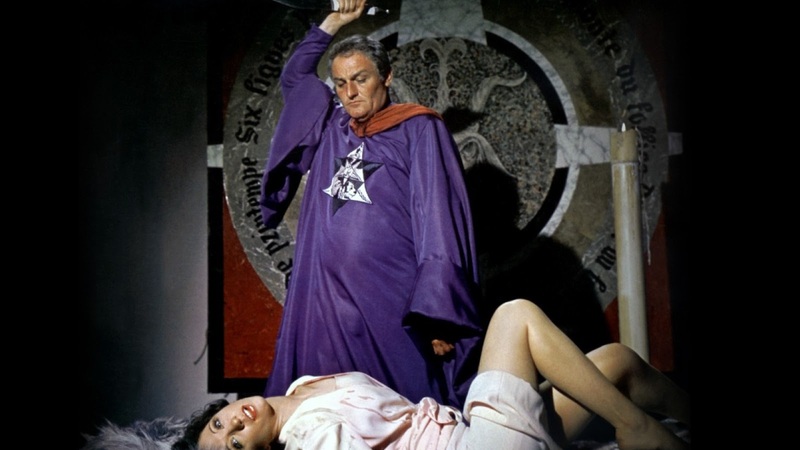 The film is set in the 1930s, but the occult themes would have been relatively fresh in the minds of 1960s housewives due to a 1960s revival of interest in the occult, perpetrated in part by British rock bands talking about Aleister Crowley in their music and buying his old house. Princess Nike Arrighi retired from acting after she married Prince Paolo Borghese, of the Borghese family that you might remember from a season of The Bachelor, if you were a fan of The Bachelor ten years ago. Nike is now a full-time visual artist. British gentry hospitality demands that if a Satanist calls on you, you must spend at least fifteen minutes chatting with him before politely asking him to leave. "Tanith" literally means "serpent lady," and originates from Tanit, a Carthaginian goddess of war. Duke Nicholas, being the protagonist of the movie, knows this off the top of his head. Nicholas throws crucifixes like Batman throws Batarangs.